How To Sleep Less? How Are Sleep & Meditation Different? Soon after beginning a meditation practice, many people report needing less sleep. Why is this the case? Here you will learn why meditation does in fact replace sleep to a very strong degree, the most critical difference between the two, and why no amount of meditation can completely replace your nightly sleep cycle. If you are looking to have a more succinct sleep cycle, then getting more of the highly critical chemical melatonin into your body is key. Melatonin is a hormone known for creating restful sleep – many insomniacs have problems producing enough of this very vital chemical, and is key if you want to sleep like a log. In a highly cited Rutguers University study, meditation was effectively proven to boost melatonin levels by an average of 98%, with many participants showing increases of more than 300%! Meditation's biological re-balancing enables the perfect amount of melatonin to flow throughout your body, helping you reach a far deeper, more efficient level of sleep. When your head hits the pillow, deep REM sleep will come more quickly and easily. No counting sheep required. Note: Training your body through meditation to naturally generate more melatonin is far more healthy, in the short and long term, than through supplementation. Play the long game. It is so easy to take our personal crises, never-ending to-do list, and other "unsolvable" problems with us under the covers. Our minds like to feed us the same stale, repetitive set of limiting thoughts, spiral of anxieties, and useless, fear based past/future narratives which do not matter to us in the present moment, especially when trying to get a good night of sleep. After all, it is believed that our brains generate more than 50,000 thoughts per day. What then, is the most effective way to re-train the "monkey mind" to more effectively deal with everyday stress, while making you immune to the mind chatter that so often prevents/delays an efficient night of sleep? Meditation. Meditation trains you to be mindful of your incoming thoughts, weakening both the physiological link and strength that each thought has on you, as well as decreasing the frequency of incoming sleep-preventing thoughts. Meditation forces the worrywart, insomnia causing mind to shift into the present moment, while realizing that the day is now over, and tomorrow is not yet here. This "in the moment" thought awareness and mental stillness are critical and often the only way to allow the mind to fall asleep quickly, sleep deeply, and in turn, maximizing your sleep efficiency, needing fewer hours per night. Meditation re-trains the ready-for-bedtime brain, ensuring deep, efficient sleep becomes the standard. Want to perfect your sleep cycle? Discover meditation. Since the body repairs itself while you are asleep, seven to eight hours of sleep each night is critical to your long-term health and well-being, not to mention your sanity! Like sleep, meditation balances, repairs and heals the body in a number of similar ways, from boosting your Growth Hormone and DHEA, to reducing your stress hormone Cortisol. Moreover, your healthiest brainwaves get stimulated in much the same way during both meditation & sleep, from boosting your Alpha, Theta, & Delta Waves to reducing your stress / anxiety associated Beta Waves. These biological boostings are part of the reason so many new meditaton practioners report needing less sleep after beginning a program. The more you meditate, the shorter your sleep cycle, with your body needing less to fully recharge your battery. #4 — Meditation Vs Sleep: How Are They Different? Can Meditation Completely Replace Sleep? It should be noted that the human body absolutely needs sleep, no matter how much meditation you do. Why? The mind is divided into a number of layers, inlcuding the conscious, subconscious, and unconscious. While meditation is critical for mastering the subconscious mind, the dream state is the best (perhaps the only) way to access all of the benefits from the deepest mind layer, the unconscious mind. 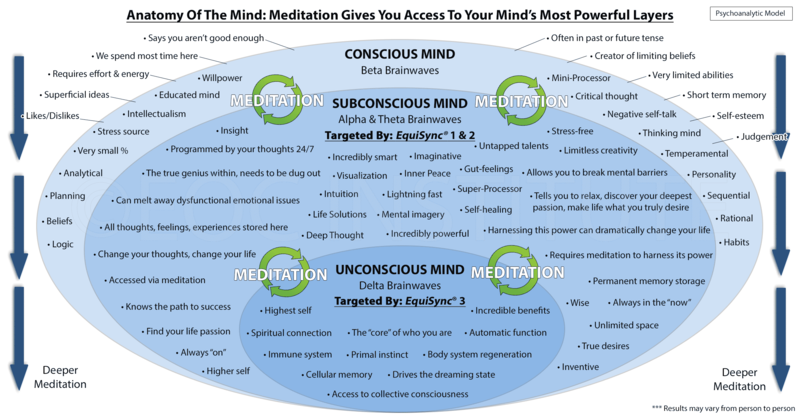 You can use the infographic/ chart below to better understand the various benefits associated with your conscious / subconscious/ unconscious mind.